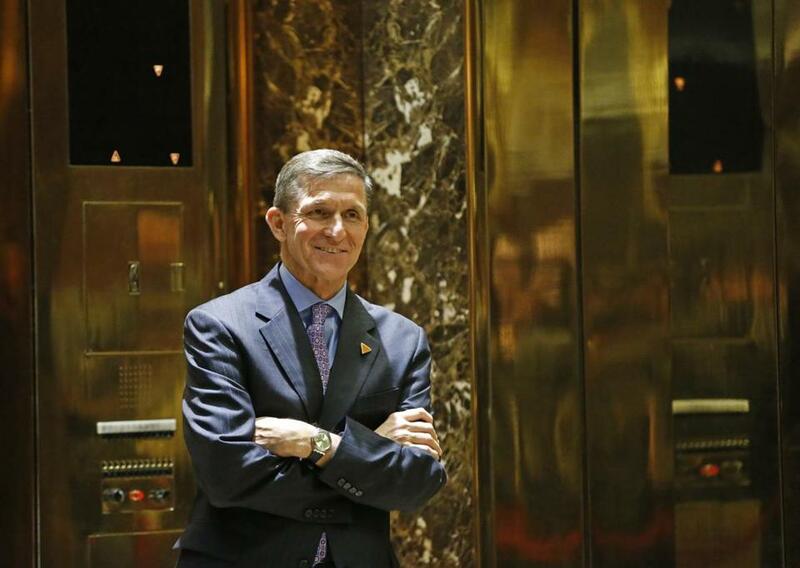 National Security Adviser-designate Michael T. Flynn waits for an elevator in the lobby at Trump Tower in December. WASHINGTON — President-elect Donald Trump’s national security adviser and Russia’s ambassador to the United States have been in frequent contact in recent weeks, including on the day the Obama administration hit Moscow with sanctions in retaliation for election-related hacking, a senior official said Friday. Trump spokesman Sean Spicer acknowledged contacts between Michael Flynn and Ambassador Sergey Kislyak, but said a phone conversation occurred on Dec. 28, one day before the sanctions were levied. Spicer said the men did not discuss sanctions. He did not specifically deny additional contacts the following day. It’s not unusual for incoming administrations to have discussions with foreign governments before taking office. But the repeated contacts just as President Obama imposed sanctions would raise questions about whether Trump’s team discussed — or even helped shape — Russia’s response to the penalties. President Vladimir Putin of Russia unexpectedly did not retaliate against the United States for the move, a decision Trump quickly praised. More broadly, Flynn’s contact with the Russian ambassador suggests the incoming administration has already begun to lay the groundwork for its promised closer relationship with Moscow. That effort appears to be moving ahead, even as many in Washington, including Republicans, have expressed outrage over intelligence officials’ assessment that Putin launched a hacking operation aimed at meddling in the US election to benefit Trump. During a news conference Wednesday, Trump pointedly would not say whether he planned to repeal the sanctions ordered by Obama. He again highlighted his warmer rapport with the Russian leader. ‘‘If Putin likes Donald Trump, I consider that an asset, not a liability, because we have a horrible relationship with Russia,’’ he said. The sanctions targeted the GRU and FSB, leading Russian intelligence agencies that the United States said were involved in the hacking of the Democratic National Committee and other groups. The United States also kicked out 35 Russian diplomats who it said were actually intelligence operatives. Trump has been willing to insert himself into major foreign policy issues during the transition, at times contradicting the current administration and diplomatic protocol. He accepted a call from Taiwan’s president, ignoring the longstanding ‘‘One China’’ policy that does not recognize the island’s sovereignty. He also publicly urged the United States to veto a UN Security Council resolution condemning Israeli settlements, then slammed the Obama administration for abstaining and allowing the measure to pass. Questions about Trump’s friendly posture toward Russia have deepened since the election, as he has dismissed US intelligence agencies’ assertions about Russia’s role in the hacking of Democratic groups. In briefing Trump on their findings, intelligence officials also presented the president-elect with unsubstantiated claims that Russia had amassed compromising personal and financial allegations about him, according to a separate US official. Trump acknowledged for the first time this week that he accepts that Russia was behind the hacking. But he questioned whether officials were leaking information about their meetings with him, warning that would be a ‘‘tremendous blot’’ on their record.